Formed in 2005 by Michigan-based John-Michael Foss and Joshua Beltram, and Californian Chaz Knapp, OBTN rapidly caught the attention of UK label Fat-Cat, and, just over a year later, released their debut album. Under their geeky appearance, the trio revealed an incredible level of sonic maturity, incorporating everything from folk and electronica to post-rock and noise. Their second album, Make Amends For We Are Merely Vessels pushes the boundaries much further. Ambitious, bold and dense, the album, which, despites only counting eight tracks, spreads over almost eighty minutes, with the shortest track clocking at just over six minutes and four others reaching well over the ten minute mark, puts to shame the effort of more established bands. The striking, and slightly misleadingly titled opening track, Rejoice, is a lingering epic which reverberates from its gentle opening right through to the screamed vocals and into the spiritual élans of a choir in its middle section before turning into a beautiful ethereal formation in its second half, bringing up contrasting heavenly tones and dark earthy moods together. To accentuate the effect, vocals are kept firmly at the back of the mix all throughout the album, coating them in layers of electronics, noise and distortions, recalling in part the process adopted by Japanese outfit and label mates Xinlisupreme, which they had themselves sourced in early Jesus And Mary Chain and Sonic Youth and tainted with occasional Aphex brushes. But while Xinlisupreme’s outputs often favoured harsh and abrasive noise backdrops, OBTN opt for more elaborate structures. The superb We Are The Living builds up momentum from its subdued opening sequence to its majestic finale, without ever loosing its melodic appeal. As They Fall Beneath Us, Trees Pt. 2, Younger and Untitled also show great melodic maturity and superb control. This is however only half of the picture here. Often, OBTN tear their songs apart and expose their bare entrails. After assembling atmospheric and vibrant openings, OBTN often turn increasingly visceral and incendiary, pilling on layers of feedback and noise to entirely drown their original vaporous melodies and vocals, and when they combine atmospheric and noise, they appear to drift into narcotic-induced dream territories (Rejoice, Trees Pt. 1). Make Amends For We Are Merely Vessels is a remarkable follow up to the trio’s debut, and one that daringly takes a different path altogether. 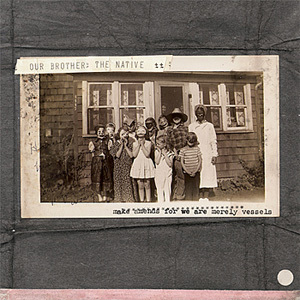 Our Brother The Native have developed an interesting musical lexicon in the last couple of years and apply it with superbly creative flair. While the mood of Tooth And Claw, which was assembled over the internet before Chaz had even met the other two in the flash, was a light and bucolic affair, this new opus, road-tested live for a year prior to being recorded in Foss’s basement, is a sombre and contrasted document of a band maturing fast.